I may have mentioned that in preparation for my greyhound parenthood I bought and read every book about greyhounds that I could find. This bordered on the fanatical. OK, so it crossed the line into the fanatical. So when Girly Girl came home I had a pretty good store of book learnin’ from which to draw. That isn’t to say I didn’t make mistakes. Plenty. I have $2000 worth of damage to my bathroom from the time I “felt bad” and decided to put Girly Girl in the bathroom instead of her crate. All the books said don’t do this. 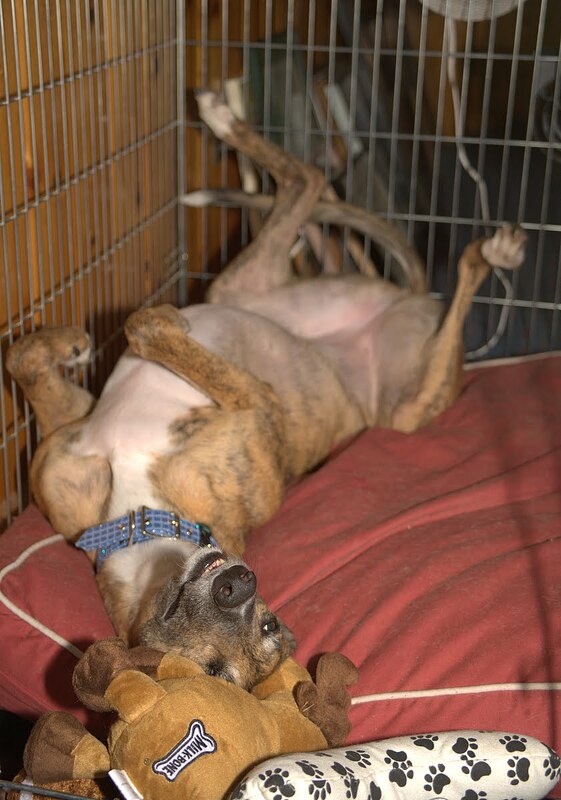 Your greyhound will feel safe in her crate but will feel anxious in a larger space such as enclosed room. Eh, what could they know about MY specific dog? What could they know about Girly Girl. She’s a steel core, brave, feisty little tiger. It turns out, they knew a lot. I continued collecting and reading books. I broadened my subject matter. I got books on canine allergies, vaccinations, raw diets, behavior and body language, health and cancer. By the time I brought my second greyhound, Blue, home, I knew a whole lot more. And even still, I have many, many more books waiting to be read. I’ve been through blood tests with Girly Girl for a non-existent flu. I went through serious emotional distress and blood tests, an abdominal ultrasound and various tick panels for an as yet undiagnosed digestive tract malady with Blue that disappeared as mysteriously as it came but which had me, and the vet fearing liver disease by it’s symptoms. Don’t ask me about the bills for these excursions. So when Girly Girl started limping in early December, all my reading immediately put me on high alert. Greyhound. Limp. Must be cancer. Most normal people would, of course, assume their dog pulled a muscle and, when it didn’t heal, take the dog to the vet. Unfortunately, when you’re a greyhound owner who’s done any reading at all on the breed, you know that one in three racing greyhounds will get cancer. And that the cancer generally manifests itself as osteosarcoma of a long bone, generally the leg. You also know that one of the first visible symptoms, if you get any warning before a broken leg, is an unexplained limp. So see? Knowledge = Double Edged Sword. When Girly Girl’s limp did not seem to resolve, off we went to the vet. We love our vet and Dr. Edelbaum poked and prodded her. She asked me a lot of questions. She took Girly Girl’s temperature about which GG was quite indignant. Based on the lack of any symptoms otherwise, Dr. Edelbaum felt she had an orthopedic problem. Since we have such a great relationship with Dr. Edelbaum, she was willing to entertain my concern about cancer and since I was the one writing the checks she agreed to schedule an appointment for x-rays. A couple days later I dropped my sweet girl off for her x-rays early in the morning. Since they would anesthetize her this involved preparation. She could have no food after 8pm the night before. That meant no “night-night” snack. That did not go over well. It also meant no breakfast or water in the morning. When I had to leave her with the technician she tried to turn and follow me back out. The look she gave me made me turn and leave quickly before I broke into tears in the vets lobby. I sat on pins and needles all morning since this was the first time since she had come to live with me that she was going to be under anesthesia. I had an appointment to pick her up at 4:30p and to discuss the results of the x-rays with Dr. Edelbaum. Just after lunchtime I got an unexpected call from Dr. Edelbaum. Initially I was in a panic fearing something had gone wrong while she was under sedation. While I was busy worrying about that, Dr. Edelbaum just dropped the bomb on me. There was a lesion on Girly Girl’s left elbow. It appears to be a tumor, suspected osteosarcoma. The dog of my heart, the furry love of my life has cancer on her elbow. Congratulations. My instincts were right. Now my vet wasn’t as unfeeling as all that, but honestly I heard cancer, elbow, instincts were right and early. Beyond that I know she was talking but I have no idea what she said. She made me write down a number and reading it later I saw that I had written the word biopsy next to it. When I called the number, it was for a veterinary referral service, or so they said. When I told them what I wanted, they set us up for an appointment for the next week. I spent the rest of the afternoon desperate to see my sweet baby girl again. I must have called Dr. Edelbaum’s office five or six times in hopes of picking her up early. In the end they did not let me do that. I also spent the time crying and thinking about all the things we wouldn’t have together. How unfair it all was. How much she didn’t deserve this after all she’d been through in her short life. I wondered how I would ever pull myself together to do whatever it was that we must do next. Oh dem bones. We think so little about them until we have to and then they’re all we think about. Say a little prayer for Girly Girl if you are a praying person. Consider reading a book or two because while knowledge can be a double edged sword, the alternative is most certainly worse. For This I Give Thanks….? OK, yes. Everyone does one of these lists at this time of year. So who am I to buck the popular trend? I fold to peer pressure. I am thankful for Blue’s horrific dragon breath, which can melt plastic and bend metal. I am thankful for the 30 plus pounds of greyhound hair that I ingest annually. I am thankful for two very gassy, smelly, greyhound behinds. I am thankful for the dog drool stains that grace my couch cushions and all the dog beds. I am thankful for the chewed woodwork and countertop in the bathroom, a remnant from an early experiment with greyhound separation anxiety. I am thankful for all the times Blue pees on his own feet (front and back, sometimes at the same time, figure that one out). I am thankful for the times Blue has peed on Girly Girl’s head. I am thankful for two cold, wet, drippy noses, which unerringly find their way to the important documents or photos newly set on the coffee table and soak them down with dog snooshies. I am thankful for the front storm door and all my windows now coated in greyhound nose prints. I am thankful for a car backseat that is no longer fit for human habitation. I am thankful for a greyhound that delights in sidling up to me after dinner on the pretext of a cuddle, only to stretch her graceful snout as close to my face as possible to let out a long, loud, juicy pirate burp. I am thankful for the many bruises and scratches suffered whilst being kicked on my couch by a stretching, dreaming or roaching greyhound. I am thankful for the complete drenching received while waiting in the rain for a fussy greyhound to find the absolutely perfect spot to entrust his precious urine to. I am thankful for the miles and miles of paper towels used in my house cleaning up various oopsies and illnesses for four legged inhabitants. I am thankful for the nasty sopping wet spot, complete with crumbs left on the carpet for me to step in (barefoot most frequently) after Blue eats a treat. I am thankful for the loss of ½ the square footage of my house to the numerous and ever accumulating dog beds (how can you ever throw out a good dog bed, right?). Thankful for all this stuff you ask? You bet. And here’s why: every one of these things means I’m lucky enough to be living with two fabulous greyhounds. Every one of these things has ended up making me laugh (a number of them took some time, but eventually….). These are the worst things I’ve come across in my life with Blue and Girly Girl. I know many people who can’t say the same with their families. And frankly, having humans in the back seat of your car is highly over rated. Seems we have developed a bit of a problem. My loving, sweet, social butterfly Blue has never been the brightest bulb in the pack. But he’s not exactly stupid either. Which is probably why he’s been able to fly under the radar for so long. Girly Girl is the smart one in the family. However, Blue has learned one trick. Down. I taught him this amazing feat of skill using a clicker and food rewards. Only I never really got around to fading out the treat. I hope you are all paying attention, since this is an object lesson for greyhound owners far and near. Finish the job. Instead, whenever it is time to dispense treats or dinner, I ask for a down. And down he goes like a lead balloon. Like the Titanic. Like the stock market last year. You get the idea. Thus, I have solidified in his mind downtreat. Treatdown. Fooddown. Downfooddinnerdown. OK, so I’m lazy and a bad dog trainer. My dog knows one trick and he fully expects to be compensated for it. Except I didn’t realize I had a smooth criminal living with me. At first I thought what he was doing was cute. I thought he was being friendly and outgoing and social. I was very proud of my big boy. I thought it so clever that he could do a trick for dog treats. Then, as I really started watching him, I realized he was working each victim over and over again. He had a plan and he employed it the same way each time, in each store. And everyone fell for it. Every time. I had a master manipulator on my hands. I was living under the same roof with a professional grifter. Maine is a very dog friendly state. We are lucky to have a lot of pet stores, both small independent and big chain. We have a list of our favorites and sometimes during the week, I’ll take the dogs to one or another to stave off cabin fever since we work at home. Blue carries a mental map of each pet store. He knows from the time we are within a mile or two of the parking lot which store we’re headed to. He knows where the treat bar is located. He knows where the registers are. He also knows where, at the register, the doggy treat bowl is located. His favorites are the treat “buffets” at the chain stores. When we get near one, he’ll commandeer the first store employee he can find and he’ll lean on him/her. Then he’ll saunter over to the buffet and, since he’s tall enough to rest his head on the counter, but not quite tall enough to reach into the treat bins, he’ll rest his head on the buffet and sniff. Blue has big floppy cheeks and he uses these to his best effect. When he sniffs, he looks and sounds something like a horse snorting. His cheeks go in and out like a spoiled child after a crying jag. It’s much exaggerated and at the end he blows out a big long sigh making his cheeks flap back and forth (with the aforementioned horse noises). Then he turns, with a quick knowing glance at me, and gives the employee big greyhound eyes, does a little prance and drops to his down position. If that doesn’t work. He jumps up, head on buffet. Looks down at tasty treats. Maybe a little drool. Sniff. Drops to down position. Looks up at employee. This ALWAYS gets him a cookie. He’ll work that angle until I stop giving the employee permission to give him cookies, or until the employee stops the flow of treats out of concern for his or her job or that quarters profits. At that point, Blue develops a sudden interest in checking out. He has two strategies at the check out counter. He invariably starts by deploying his “Sing for Your Supper” scam. Here he attempts to induce the employee manning the register to believe that he is either A) an actual store employee and thus, it is OK to give him unfettered access to treats or B) willing to work by assisting with check out operations such as bagging, money counting or merchandise inspection in exchange for biscuits. To accomplish this he deftly steps behind the counter, joins the employee at the register and begins his attempt to assist with various tasks. He pokes his nose into bags, sniffs customer merchandise, sniffs money as it is handed over and generally makes a nuisance of himself. Employees find this so endearing that they throw handfuls of treats into his open gob. When the flow of treats begins to slow down from that side of the counter, Blue steps back around and rejoins his Mumma in line. He now employs the Hail Mary Play. He has worked the employees in the store and at the doggie buffet. He has already worked the employee at the register. However, there are two sides to that check-out counter and by dog he’s going to make sure he has squeezed every last treat possible out the store before we exit. Here he again employs the head on the counter and the Mr. Ed sniff. That usually will get him a treat or two. But the main component of the Hail Mary Play is simply a repeated series of downs. The downs themselves are not special. But add in that the big giant goofy white and gray hound is willing to set the Guinness Book of World Records for the number of downs completed at a check out counter in a pet store all the while staring at you unblinkingly with amazing amber eyes and generally Blue can induce any register operator to pour the remainder of the treat bucket directly into his waiting gullet. Having thus accomplished his mission he contentedly waits for Mumma to finish paying for her purchase. We head out of the store the kids have a quick sniff and a pee and I load them into the car. Blue stands at the edge of the seat and waits, staring at me. “What? !” I say. But I know what he’s waiting for. He wants one of the treats I’ve just purchased in the store. Adopting a greyhound is not a singular event. You don’t pick up a dog, take it home and begin life as a pet owner. It’s a little like getting married. You also end up with a whole network of greyhound caretakers, fanatics and rescuers as well as their hounds that become part of your extended family. You add friends all over the world who are connected via the internet and the various social networking outlets, all who share the love of greyhounds with you. In my greyhound infancy, I actually thought myself quite clever and groundbreaking when I set up Facebook pages for Girly Girl and Blue. That lasted all of 30 minutes until the first 15 or 20 friend requests came in from other greyhounds, whippets and iggies. Since then we’ve friended more sight hounds than I can count as well as tons of other dog breeds and even a few cats (if they had the right attitude-or should I say “cattitude”). The tightest group I’ve developed within my larger greyhound network is my “Meet and Greet Family”. These are the people and hounds we see every weekend at the various meet and greets in the Mid-Coast Maine area. Everyone goes to everyone else’s event to support each other and, let’s admit it, as an excuse to get together. This group has ended up holding Christmas parties together. We’ve had summer barbecues together. We’ve been to each other’s birthday parties. We’re in touch via email and phone when we’re not together on the weekends. 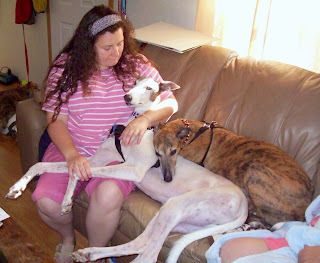 We as greyhound caretakers adopted our hounds because we love greys. While our own furry babies are like our children, we love those of our extended greyhound family as well. Heck, we love strange greys we meet for the first time. We love photos of greys we see on Facebook and Twitter. I wanted to drive to Georgia to pick up one handsome guy I fell in love with via photos shared on Twitter. That was just last month. That’s why it hurts so badly when one of the hounds in your extended family becomes seriously hurt or ill. We all worry as if it were our own. Recently one of the hounds in my “Meet and Greet Family” began suffering from some problems with his stomach. He was not eating well. Visits to the vet didn’t seem to turn up anything. Eventually poor Indigo (known to all of us who knew and loved him as “Indy”) was vomiting everything he tried to eat. His mum was beside herself with worry. Events seemed to move so quickly from here. Poor Indy went to the vet where they found a number of masses in his abdomen. The worst was suspected and his mum was faced with the horrible prospect of saying her goodbyes to him before he went in for his exploratory surgery. The suspected cancer was indeed found and Indy’s mum gave him the last gift that she could give him though it broke her heart. She let him go during the surgery. Though you can never really know the full pain of this loss unless you are the unfortunate soul who has to suffer it, the news of Indy’s passing shook our circle to the core as though the loss had happened to each of us in some way (and in fact it had, in a way). We all looked at our own hounds and thought of them in the same place. We worried about hearing the same diagnosis. If you are a greyhound caretaker, you always live in fear of the dreaded “C” word. And we felt the loss of our sweet Indy who was a little bit each of ours just as our hounds belong a little bit to the others in our Meet and Greet Family. Indy had the softest fur of any greyhound you have ever met. He was a mellow character who got along with all creatures, four legged and two. He loved peanut butter and got a peanut butter bone every day from which he would wear a little bit on his cheeks as if to save it for later. He was his mum’s only “child” and the apple of her eye. Our Meet and Greet Family, and the greater greyhound network will all huddle in a little closer to help Indy’s mum and indeed us all to bear the loss of another gentle soul. That is one of the incredibly sad things about life with greyhounds but it is one of the many great things about being part of the Great Greyhound Family. We recently had to travel to Plattsburgh, NY for my job. This is where the “home office” is and so from time to time, we travel there so they remember what I look like and why they hired me to begin with. Now I did say “we” went to Plattsburgh. Among the many things I love about my job is that they let me travel with the four legged kids. In fact, Girly Girl and Blue may very well be better traveled than the motif/mascot on the sides of those buses…. My pups are pros at staying in hotels. In fact, I suspect that Blue would rather live in a hotel. In hotels, he believes he can jump up onto the bed. Blue has a mental block that white dogs cannot jump. When he isn’t paying attention or he is distracted, or in dire straits, he can jump like a grasshopper. When he thinks about it, he freezes up and has to be able to step up or he won’t go there. Luckily, he can step into the back seat of my car, or else I’d have a hernia by now. There are days when even that is a challenge for his poor afflicted mind. For whatever reason, he suspended belief during one of our early stays in a hotel. I think it was out of pure jealousy that Girly Girl had this giant bed to herself. After he whined and I refused to lift him onto the bed, he gave up and launched himself. A monster was born. Since that day I’ve always had to get a hotel room with two beds in it. One for me and one for Blue. I know what you’re thinking. “For heaven’s sake, it’s a dog! Make him get down!” There are two problems with that theory. First, greyhounds aren’t really dogs and second, they can be more stubborn than the most ornery mule ever thought of being. Wrestle him off the bed (and I do mean wrestle) and he’ll run to the other side and jump up. If he doesn’t wear you down with that trick, he’ll definitely be fighting with you for pillow space the very second you fall asleep. Until then, he will stand and stare at you from the end of the bed. Pretty soon you wonder if he’s going to eat you or sneak up on the bed when you fall asleep. I decided that I never really wanted to find out which way he’d go, and so we get two beds. I get a good nights sleep, I keep life and limb and the big dog is a happy boy. We were on our last night in the hotel for this particular stay. The plan was to drive home the next day, having completed our work visit. It turned out there was some big concert in town and thus the hotel was full of young people drinking in their rooms, running the halls and generally being obnoxious (yes I realize I am in danger of sounding like my mother here). We had to change rooms because our first neighbors turned out to be concert goers holding a rousing game of beer pong prior to departure. We were not excited about following the progress of the game. We moved to a nice quiet wing. The night desk clerk wished me good luck sleeping. He wasn’t kidding either. We had been sleeping for some untold number of minutes, or maybe hours when slumber was ripped violently apart by a horrible buzzing/ringing/pulsing squall. It’s never good when you wake up saying, “What The F____??!!!?!?!?!? !” In my confusion I start groping around for my phone to either answer it or turn off the alarm. Ooops, I left the phone out in the car. OK, so the hotel alarm clock. No wait, I unplugged that to plug in my computer. Then….OH CRAP! THAT’S THE FIRE ALARM! I spring out of bed. Hounds do same. Big excitement. Rush to the door and look out the peephole. Wait, are you supposed to do that in a fire. Oh well, too late. No flames, but holy cow, there’s smoke. Feel the door. It’s not warm. Crack the door open, yep, definitely smoke and something seriously burnt. OK, guess we’ll be vacating. 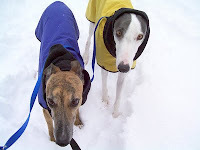 Ever wonder how fast you can get two greyhounds into coats, harnesses and leashes? Try it when you think you may be in a burning building. Once we were all fully geared up, throw the door open and prepare to run the gauntlet of flames. OK, no flames. But more smoke and the smell of something very burnt. The hounds were incredibly brave considering the noise from the alarm, which was directly outside our door, was deafening. They followed my lead and never showed fear. It seemed we were the only people on our wing who wanted to live. Either that or we’d taken longer to get ready than I thought. We make our way down the hall (of course we’re at the VERY far end) to the lobby. More smoke and that awful burning smell. Two hotel employees are loitering about in the lobby and they direct us to go outside. They didn’t seem very alarmed. We joined the ten or fifteen other hotel guests sitting along the curb out front. This was definitely not the full complement of hotel guests. Blue immediately began working the crowd. He demanded attention from everyone he could reach within his leashes radius. For him this was like a bonus meet and greet, only later and colder. Girly Girl had been about as brave as she could muster and she proceeded to stuff herself into my lap. There she stayed shaking like a washing machine on spin cycle. Pretty soon every fire truck in the city of Burlington rolled into the hotel parking lot. Girly Girl found a way to get inside my coat with me and then attempt to keep an eye on those noisy trucks out the sleeve. More fire fighters went into the hotel than there were hotel guests milling around outside. They had all manner of gear and hoses and poles and axes. Blue tried sneaking in with them but as usual, mumma ruined all his fun. They came back out a few minutes after they went in, still lugging all their gear. The verdict? One of the concert goers microwaved an unknown substance to the point where it went from charcoal, to carbon to a diamond. Since the microwave resides in the lobby where, presumably, the night desk clerk also sits, this had to be some kind of trick. We got the all clear to return to our rooms. Girly Girl was practically dragging me towards our wing. Blue had other plans. Standing in the lobby was a fire man, waiting for the small herd of hotel guests to come in so he could go out. Blue zeroed in on him as though he were a meaty bone. Apparently, for Blue, here was his big chance and the fire man never knew what hit him. Before the man knew it, he was fully charmed by this 80 pound skinny walking sculpture and he was down on his knees in full turn out gear giving Blue all kinds of love. I never knew that Blue harbored a secret desire to be a fire dog. I guess it never really came up. But I suppose he figured he was almost as spotted as those Dalmatians (at least his skin is, but he has to be soaked down to really show this to his best benefit). And he could certainly do whatever it is that the Dalmatians do, only much faster. In the end the fire man reluctantly joined his compatriots on one of the many many trucks and Blue got no offers of employment. If we are lucky, he’ll never get another opportunity to apply. 25% of the time: Dogs literally stuck to my hip via some body part-generally by pushing their heads into my side or leaning on me. If I am on the couch, they will be sitting on me. Laying on me. Putting their heads or paws onto my computer keyboard. They are not called Velcro dogs lightly. 50% of the time: Dogs within inches of me, or lightly touching me with some body part. Cold noses stuck to the one spot of skin showing. A paw stretched out to touch you. A head laid on your foot. A tail across the face. 24% of the time: Dogs placing themselves within sight line of me. There are some pretty interesting contortions to accomplish this goal considering the set up of my living room and office, but greyhounds can, and will, get it done. .05% of the time: Dogs know I am in the house with them, know where I am but can not get to me or see me. This is cause for consternation. Generally there is whining and attempts to stuff ones doggie parts as near to mumma as possible. This might include stuffing noses or legs or any other parts possible under doors, through gates or using each other as catapults and step ladders. .05% of the time: Dogs cannot see me and do not know where I am. Since I come back to a house that is no more of a disaster zone than when I left it and no one is bloodied or in need of stitches, I assume that they muddle along fine once I get out of sight. There is a general melee of rejoicing and happiness at my return however. And that leads us to the title of this piece. Yes gentle reader, should you leave the bathroom door open even a small crack when you use it, you will, in fact, never pee alone. An open bathroom door to a greyhound, is the best thing EVER. It is uninterrupted quality time with a human who is a captive audience. Blue and Girly Girl have even accompanied me to the bathroom at 3 am, waited patiently while I got sick from some bad Chinese food and then insisted that I pet them with my free hand. When you get a greyhound you just simply learn to live with the fact that they will want to be everywhere that you are. It is in their nature. No situation or bodily process drives them from your side. No, my friends, you will NEVER pee alone. Girly Girl and Blue’s Grammy recently fenced in her fabulous flat, obstacle free back yard. This has been a great boon to us all. We have always liked to visit Grammy but now there is even more reason to sneak over there every time we’re in town for a few quick hot laps before heading home. These visits are always quite fun. Sometimes Grammy’s boys join us and Girly Girl, Blue, Fox and Crandall have a free for all for about 5 minutes. Then everyone stands around looking at each other until we give up and go inside for some treats or the three of us go home. So one night last week we decided to sneak over to Grammy’s for a quick run. It was already dark but we knew the back yard so well by this time that I didn’t think much about it. I let the furry kids off their leashes and urged them off to work out the excess energy. They took care of the obligatory investigation and took care of covering over all the spots where Fox and Crandall had marked. They jogged back and forth a couple times and then they disappeared around the far side of Grammy’s house. A way to tease the hounds suddenly presented itself to my diabolical mind and I turned and headed to the far side of Grammy’s garage so as not to be seen when they came back around to the backyard. This, I knew, would send them into a frantic search for me. I was giggling to myself when I heard the first cavalcade of canine feet begin from the far side of the house. Any moment they’d come flying around the corner of the garage and barrel into me, all in a panic that I had left them behind. Hey, I love them, but I’m still an evil, evil girl. This, I might add, is one of the many reasons I don’t have human children. Except it turned out the joke was on me and that was not even close to what came into view. As I peeked around the corner of the garage, there came streaking from the side of Grammy’s house, Girly Girl. She was moving as fast as I have ever seen any greyhound move. That includes the greyhounds I saw running in the live races at Raynham when we were at the adoption expo. This was a hound that seemed not to have been told that she had a fractured hock. I stood marveling at how fast she was running. Then I marveled at the absolute beauty of her movements. The art and grace of a greyhound running at top speed with full intent and purpose. Then I realized there was a reason for her laser focus, and she was NOT ALONE. Not quite one whisker’s length ahead of her was a white ball of fluff, running for its poor, pathetic, furry, soon to be cut short, life. My brain started the calculations and I quickly ruled out the possibility of reaching the pair before Girly Girl had the desperate cat at the far corner of the yard in the 90 degree bend of the fence. I looked around and saw Blue trotting out from the side of Grammy’s house. His ears were up and he was watching the proceedings as I was though his expression was one of mild interest and amusement while mine was one of dawning horror as my mind rapidly went through and discarded the possible actions I might take. Run real fast and save the cat-yeah right. Stand there and pee my pants while covering my eyes and twisting my mind around the fact that I’m going to have to collect the pieces of someone’s cat in a plastic bag-that’s probably more like it. I yelled for Girly Girl to break off the chase. I could almost hear Blue laughing to my left as he watched events unfold. If Girly Girl even knew of our existence at that point, she showed no sign of it. My ability to influence the outcome of this play was essentially nil. My brain started working up pictures of the murder scene complete with crime scene photos, a tape outline (actually many little tape outlines of the various pieces) and Girly Girl being led away in muzzle and cuffs. What is the protocol in a case like that, do you bring the plastic bag and try to find the owner or give the remains a decent burial and let the poor owners wonder what happened instead of knowing the awful truth? Within a split second, Girly Girl had covered the distance between the side of Grammy’s house and the corner of the fence. She was upon the cat and like some very bad African documentary where they actually show the lion making the kill, I watched as she grabbed the cat by the back and began to shake it. At this point, I’m pretty sure I was just emitting squeaks. Possibly supersonic. Blue was looking at me strangely instead of watching the drama in front of us and there were a large number of bats gathering on the eaves of the garage. At the last possible second Fluffy the White gave it one last college try and reached up behind him firmly attaching his front claw to Girly Girl’s cheek. This was enough to startle her (What? It bites back?) and she opened her mouth dropping said kitty who wasted NO time in beating feet. Girly Girl recovered her composure quickly enough and was soon back on kitty’s tail as they raced up the back side of the yard, along the fence line. Kitty, apparently not one to make the same mistake twice, saw the approaching corner at the opposite end of the yard and decided he may not be as lucky a second time. He made a dive for the fence and scrambled underneath it. There was a small clearance there but without a doubt there is a white cat wandering around this week with newly coiffed reverse Mohawk who might be a bit tender and whose caretakers are probably very puzzled as to his disheveled state. If they only knew. For her part, Girly Girl transformed from the steely eyed killer to my sweet Boo-Boo the moment the cat was out of reach. Like a miracle at Lourdes, she could hear again and came trotting over to cuddle up to mum who was on the verge of a breakdown, squeaking about “No Girly Girl, noooo…..” over and over again. She spent the rest of the evening hyped up on adrenaline, pacing back and forth. Alternately abusing toys and panting like some overgrown schoolyard bully. Then curling up with mum or Grammy and smiling in self-satisfaction over the successful hunt, making sure to show off the war wound where kitty had sunk claw in flesh. And the next day she remembered that she had a racing injury which retired her and oh yeah, that’s why I don’t run so fast anymore. Girly Girl continues to recuperate from the adventure. I still have nightmares about white cats and Grammy says her yard has been cat free since that night. Seems cats talk and word is out in the neighborhood. The feline miracle cure is not recommended for anyone, not hound, not human, and especially not cat. Greyhounds can only legally race until they are aged 5 years. Then they must be retired and, if they are lucky, they are placed with a rescue group where they find forever homes. Most dogs don’t end up racing that long however. Many things can happen to end a hounds career early including catastrophic injury, refusal to race (anything from running the wrong way on the track to refusing to enter the starting boxes), being a nuisance on the track (menacing other dogs, pushing, bumping etc), and most commonly, a downward slide in performance. Racing is, after all, a business and if the asset does not pay for itself, then it must be written off the books. As cruel as the business of racing can be, many greyhounds truly love their jobs. My big lummox Blue is one of those boys. 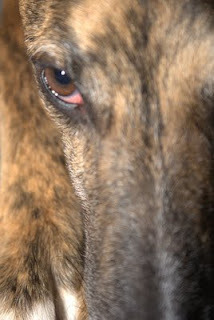 He was blessed to be born at a good greyhound farm with an owner who cared about her hounds. He ended up with a trainer who cared about all his dogs at a track that was, relatively speaking, among the best in the country for treatment of its racers. Blue has no bad memories of his racing career. Retirement wasn’t easy on the old boy. He was retired because his performance began to dip and then slide and eventually bottomed out. I don’t think he was ready. Blue cannot hear the notes of the “Post” without going into full flashback mode. Every muscle in his body taught and quivering. He, on alert, looking all around for the starter’s boxes, wondering, I’m sure, when his race starts. We first discovered this, of all places, at a baseball game at which they allowed pets. I brought Blue and Girly Girl. Over the loudspeaker came the familiar trumpet notes of the Post (or Charge for those of you who may not know it as the Post, or Tally Ho for the polo set). Blue was frantic to get to the field and take his place in the box. When they played it again a while later, it was ‘sixty seconds to the next race, place your bets, place your bets.’ Diagnosis confirmed. We had the opportunity to view some live greyhound racing when visiting Blue’s old stomping grounds. It was a reunion of sorts, so there were about 100 other retired greyhounds also watching. Picture this scene, if you will. The race is about to begin, the tired dirty ragged piece of fur that serves as the lure (fondly known as Senor Speedy we find out later during the Kennel Tour) has begun it’s course around the track. The humans cannot yet hear it. But like a wave, from one end of the grandstand begins a ruckus of barking and rooing and howling and dogs dancing and jumping around. At first you wondered why, then you caught sight of the lure and you heard what to the hounds was old news. It was a chain reaction down the crowd of hounds as each one caught the sound of the lure coming, ahead of humans. Then the sound got to Blue. I have no words to describe his reaction. The noises that came out of him. The gyrations and leaps. He managed to drag me and Girly Girl across the apron from the grand stand to the fence at trackside and nearly managed to clear the fence to get back on the track. Had I not sacrificed my rotator cuff, he would have made it. When I peeled him off the fence, not only were the rest of the humans staring at us, but all the hounds had stopped barking and rooing to stare at us as well. Strangely, there was a wide perimeter around us for the next race. I think Girly Girl was thoroughly embarrassed as she has no good memories of racing and finds these annual pilgrimages to Blue’s track singularly distasteful. She won’t poop for three days before the trip and waits until we get back on track for the parade. You can guess the rest. I’ve learned to bring a large shopping bag to accommodate the clean up. But I digress. So my poor boy lives in a state of denial. Being forced into early retirement when he had many a good (in his mind) race left in him just didn’t sit well. In his dotage Blue is working harder than he ever worked when he was a professional. Blue is currently running a race just about every day. When its post time and he’s heading into the box his breathing gets heavier. When he’s getting jostled around he grimaces and growls a bit. When he wins, after he is done running, he wags his tail (he always wins). And then he always wakes up from his race with his tail still wagging. Now if I could just figure out a way to bet on those races…. My first greyhound was (and is) Girly Girl. I did a lot of research and preparation before I got her because I lived in apartments for a long time before I finally got a house and was in a position where I could have a dog. I knew all those apartment-dwelling years that my dog would be a greyhound. I read all the books (come to my house, they’re on my bookshelf, well thumbed through). I bought bowls, beds, toys, leashes, collars, a crate and all sorts of other gadgets and gizmos designed to make life with your new best friend fun, easy and carefree. Most of those bowls, beds, toys, leashes, gadgets and gizmos are still downstairs still stored where I carefully stacked them. One of the many decisions I made in preparation for my first fur pants wearing child was that the animals would not get on furniture. Not on the couch, not on the bed-not on any furniture. I am in no way the first person to have made this decision. And definitely not the first one to now say, what on God’s green earth happened!? I’m not even sure when it started, or how. For a long time I stuck to the rule. No dogs on the furniture. I slept in a lovely dog free bed. My couches were dog hair free and there was plenty of space to sit, or stretch out. When Blue joined Girly Girl here I continued to stick to the rule. One day I realized she was also laying there next to me on the couch. What! At first she w as such a polite little lady. She’d demurely wait for my permission (implied most of the time by a glance her way). Then, if I was on the couch, that was permission enough and she’d join me there. Now if I am in any way blocking access to her “spot” at the very end of the couch, she will begin whining at me. Should I rudely take no notice of her, she will correct my oversight by barking in her “indoor” voice. If that gets no response, she will let me have it with a barrage of barks at full volume (sure, greyhounds never bark-I remind her of this ALL the time). Should I not move to let her up, look out, she’s coming up anyway and I’m going to get 60 plus pounds of flying greyhound on my shins or possibly knees if I’m laying down, in my lap if I’m sitting there. If I still won’t move, she’ll settle herself down as best she can on top of my legs or knees laying at an odd tilt, all akimbo and stay that way for the evening. Should I rearrange her to save my knees from dislocating or my shins from snapping, or to get my quilt out from under her, she shoots me a dirty look. “I gave you every opportunity to get yourself situated. Now you want to disturb me?” Wait a second. Whose couch is this? Who paid for it? Who worked to get the money to pay for it? Why am I apologizing to a hound and begging her pardon? Isn’t the rule no dogs on the bed or on the furniture? Sure it is. I can hear all the other greyhound owners out there laughing now. Today Google noted that it was the birthday of the ubiquitous barcode. One of the links they provided to round out our education on the oft overlooked workhorse of commerce was for a site that would allow you to generate your own barcodes. For FREE! I wondered if the National Greyhound Association was aware of this free bar code generator? Instead of tattooing numbers in hounds ears, give each one a barcode. One scanner at each track and it would be very easy to ensure that each dog in a race was truly the dog that was registered under that name. And at the finish line, instead of cameras, they could install something similar to the price check stations in Target and Walmart. It would read the racer's barcodes as they crossed the line. No waiting around for official race results. A matter of seconds for the scanner to post the winners to the big boards and make or break some pensioner's day. Just imagine kennel management efficiencies. Scan each hound as they receive their food. Scan again as they head out the door for their potty breaks. Scan again when they leave for training. Simple inventory management software and you have a record of all kennel activity. Hmmm, upon further reflection, I hope that the National Greyhound Association never finds out about the free barcode generator. Greyhounds have unerring internal clocks. And they love routine. They were born to routine. They were raised with routine and they spent the majority of their adult life up to the point they joined their forever homes living in a comfortable routine. Woe is you if you don’t continue to provide them with a semblance of routine. Actually, I take that back. If you don’t continue to provide them with a semblance of routine, no problem. They’ll provide one for you. In their racing life, Blue and Girly Girl, the two furry loves of my life, would rise very early. They would be fed, taken out and then they would go back into their crate, or, more than likely, they would go for training or to the race track for pre-race activities. In Mumma’s world, there is a lot of sleeping in whenever it can be managed. Except that now, I have two furry alarm clocks. At 5:45 am sharp, every morning, Girly Girl’s cold, wet, nose pokes its way under the covers to announce it’s time to get up. Thus begins a round of pleading (yes, pleading) with my dog for 30 more minutes to sleep. She will lie down beside the bed and give me 15 more minutes to sleep. Then she will get very close to my ear and begin whining. Soon Blue joins her with his dragon breath. I begin pleading again. “Come on guys, just 10 more minutes. Then I’ll get up and get you breakfast. I’ll even give you extra.” That sometimes works. I get 10 extra minutes. But no more. Some mornings I may wheedle up to 30 minutes extra out of them and sometimes no more than 15 minutes. But there comes a time when they will not leave the side of the bed and I know it is time to get up. There is a similar process at 5:30p when it is time to quit work (I work from home). And I have to promise my life away in order to work any extra time. Another process to keep me in line about their lunch time snack, and their dinnertime. They herd me around all day long. But if they seem a little obsessive compulsive, you can’t blame them. It’s just the way they were raised. Schedule = good. Chaos = bad. Oh just a dollar for every time I hear that! But the jokes on you all, because Greyhounds aren't really dogs. Not in the sense that other dogs are "dogs". Because most greyhounds spend their entire lives being trained to race, or racing, and thus they have an entirely different sensibility than the ordinary household pet. They don't learn how to play with toys or other dogs. They don't ever see other dog breeds and know only greyhounds. They see few people other than their caretakers and that is for a few short hours a day. Coming to retirement for a greyhound can be traumatic at first. They don't know about stairs, glass doors, windows, tile or linoleum flooring. They may be the only dog in a home when they've spent their whole life with no less than 30-50 dogs at all times. They probably have never ridden in a car before. Some may be dealing with career ending injuries in addition to this whole new world of retirement. This unique life experience combines to create a creature with a gentle soul (yeah, go figure). A couch potato who sleeps most of the day but who can reach 40 miles an hour given the chance. A creature who will be absolutely devoted to you, heart and soul. Who will capture your heart in return. Who will ruin you for other dogs and make you a fanatic and unapologetically so. Since the first brindle girl came home in my back seat with her tail tucked tightly between her legs, I have had more adventures than I can ever relate. Adding her "brother" a breathtaking amber-eyed white and blue behemoth only added to the laughs we've had every day. I changed, on that day I brought my girl home from being a person who always liked dogs to someone who was completely nuts about greyhounds. Someone who began living, breathing and dreaming about greyhounds. Someone who began photographing only greyhounds. Someone who began collecting all things greyhound. Someone who began reading every book about greyhounds she could find. Nuts. Absolutely nuts. In this blog I hope to chronicle my change and how much better my life became as a result. To put down the daily ridiculous things that happen to us in order to remember them. Time being such a thief and memory a fickle thing at best, I hate to lose even a minute. And with that...let the blog begin. Oops, I think it just did.